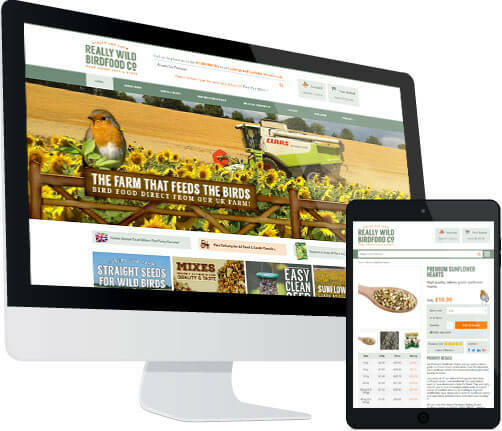 Really Wild Bird Food came to us because they wanted a bespoke ecommerce website with a sharp, responsive design and great front and back-end usability. With a huge variety of bird/wildlife products in stock, the company owners needed an effective way to market and sell their goods to a nationwide audience, and having seen some of our previous ecommerce projects, they decided that Designer Websites were the right team for the job. 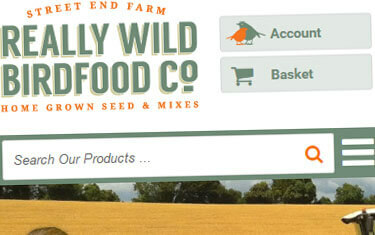 We created www.reallywildbirdfood.co.uk, a responsive online store with a bright, user-friendly design that perfectly encapsulates the home-grown charm of the Really Wild Bird Food brand. Every part of this ecommerce solution was tailored to suit the client's specific requirements. "Employing Designer Websites was a very good decision. We had been with our previous webmasters 10 years and I was very anxious about making the transition to a new company however I need not have worried. Designer Websites have been fantastic!They are professional and very easy to work with. I love my ‘new look’ website with its attractive, modern, and uncluttered appearance. My customers also say how easy they find it to use. I can ask Jason for his opinion and I know that he will be happy to give me an informed opinion based on his experience and knowledge. Jenna is my Account Manager and I have full confidence in her. Any problems or issues that we have are quickly and effectively dealt with and lines of communication are always open. Jenna will schedule work for us. I can’t say how organised it is in her office – but from my customer perspective she always seems very organised and on schedule ( and also very patient)! Early on we had a worrying problem with Paypal integration that happened over the Christmas period, and despite the fact that DW were on holiday, there was a technician into the office almost immediately to fix the problem for us. I really like the fact that there are never any surprises regarding costs. I agree a price for every piece of work they do, and their invoices always tally. We have now been with DW for just over a year and our sales have started to grow again after a period in the doldrums. Ruth has been managing Google advertising for me and she is really helping to drive the sales growth. I love the fact that working with DW does feel like a real ‘team effort’ and I am extremely glad that I found them. 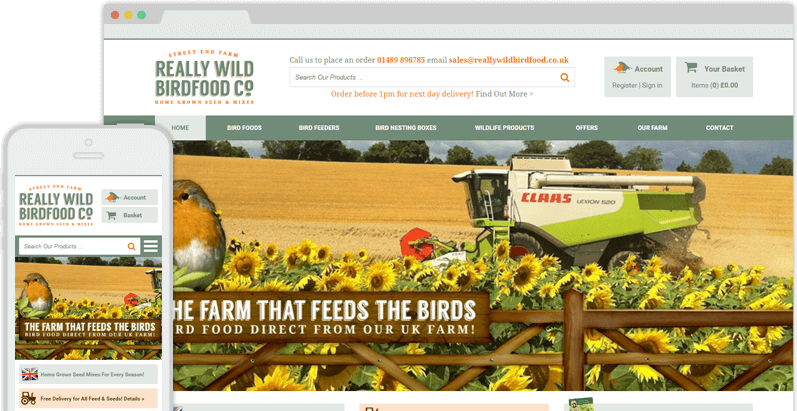 Ecommerce Website Development: Really Wild Bird FoodThe Really Wild Bird Food Co. is a family-owned business based in the picturesque Hampshire countryside. Husband and wife team Richard and Lesley Smith own and operate Street End Farm with the help of a small but dedicated team of employees, and it is here that most of their bird seeds are grown. The Really Wild Bird Food brand is built upon the company’s reputation for high-quality, home-grown British bird food, and Richard and Lesley emphasised from the beginning that these characteristics would need to shine through in their new website’s final design. As online stores go, the new Really Wild Bird Food website is very well-stocked indeed – Street End Farm’s wide range of seeds and feeds is further bolstered by an enormous array of feeders, nesting boxes, squirrel guards, bird whistles, and countless other complementary accessories. In order to make this ecommerce website as user-friendly as possible, we had to think very carefully about the site’s structure and how best to divide this extensive variety of products into an intuitive hierarchy of categories and sub-categories. However, our hard work definitely paid off: the finished website is easy to navigate and use, and we feel that Street End Farm’s sunny, all-natural appeal shines through on every page. Responsive DesignRoughly half of Really Wild Bird Food’s site traffic comes from portable devices such as tablets and smartphones, and so a key part of the design stage for this project was ensuring that the new online store would function just as well on mobile devices as on desktop browsers. Our design and development teams worked closely together to give the site a fluid responsive design that adapts (or ‘responds’) to the size of the screen you’re viewing it on - thus providing a flawless user experience every time! Content Management SystemWith so many different products and categories to juggle – and new additions coming in on a regular basis – the Really Wild Bird Food team needed a back-end CMS (Content Management System) that would make it easy for staff to add and edit items at a moment’s notice. 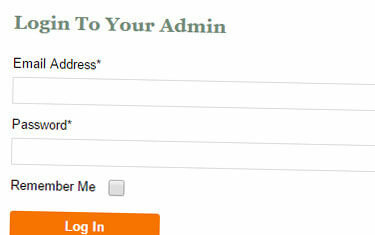 In addition to designing a user-friendly online store for customers to browse, we also developed a sleek admin console that only the site owners can access; not only does this enable quick and easy product management, it also allows the team to moderate customer reviews, set up special offers and promotions, and of course view all order details at the click of a mouse. 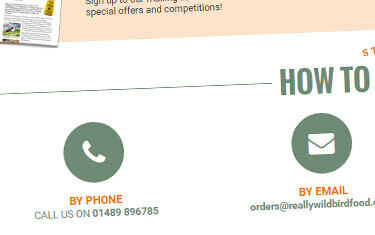 Telephone OrdersThe Really Wild Bird Food team were conscious of the fact that online ordering is not necessarily everyone’s preferred purchasing method – indeed, many of their loyal customers prefer to place orders by telephone. In order to accommodate this, we built a telephone ordering system into the website itself: when taking orders over the phone, staff members can now use this special system put the transaction through the website and use their administrative privileges to bypass the payment stage.